Phalaenopsis orchids originated in southeastern Asia and naturally extended from the Himalayas to Cape York Peninsula. From just 80 odd species thousands of hybrids and cultivars have been produced to this day. At Flowers for Everyone you will find a magnificent wide selection of beautiful coloured Phalaenophis Orchids to send as a picture perfect gift to someone special today. 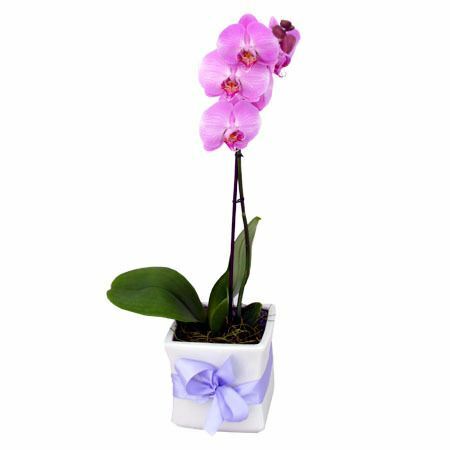 Our suburb Orchids, come beautifully presented in a stylish European ceramic pot and are impeccably presented in a delightful gift box. Select from a beautiful colour range of purest Whites with a lemon center, to hot magenta Pinks, lovely Lemon shades to intriguing Bi-colors of Purple and Whites. Call us 1800 66 66 46 today, to discover what wonderful colors we have available for immediate delivery today. Temperature; Phalaenophis Orchids enjoy a fairly warm climate, from 20 to 22 degrees, since this is the temperature range similar to many of our homes indoors, it make for an ideal indoor home or office plant. Light and Shade; Phalaenophis Orchids do require too much light to grow well, the ideal light required. If grown in a windowsill, an east exposure proves to be the best. You must take care though, not to burn the plant by allowing too much sunlight to shine directly onto the plant, its best to provide some shade to the orchid; a sheer curtain would work best. Watering; Its best to water the orchid in the morning, this ensures a complete water evaporation on the foliage and the roots. Generally water the orchids once every 4 to 7 days. Avoid standing the orchid in water. The weight of the pot is a easy gauge to let you know when it requires additional watering, if the pot is still heavy and not light then its not time to water your orchid.